Autumn is coming and that means it’s time to shift our mind-set from Summer activities to harvest events, Halloween, Football season, and tons of pumpkin spice everything! I’m in a family of all boys, so naturally football is apart of my life…I had to include it! 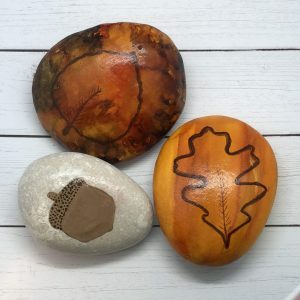 Need some new Fall rock painting ideas this year? If you’re looking to try a new art medium, consider alcohol inks. It’s a new paint medium that I have been using on rocks this year and it’s easy for beginners. If you never used alcohol inks before, read my beginner-friendly guide on using alcohol inks on rocks. 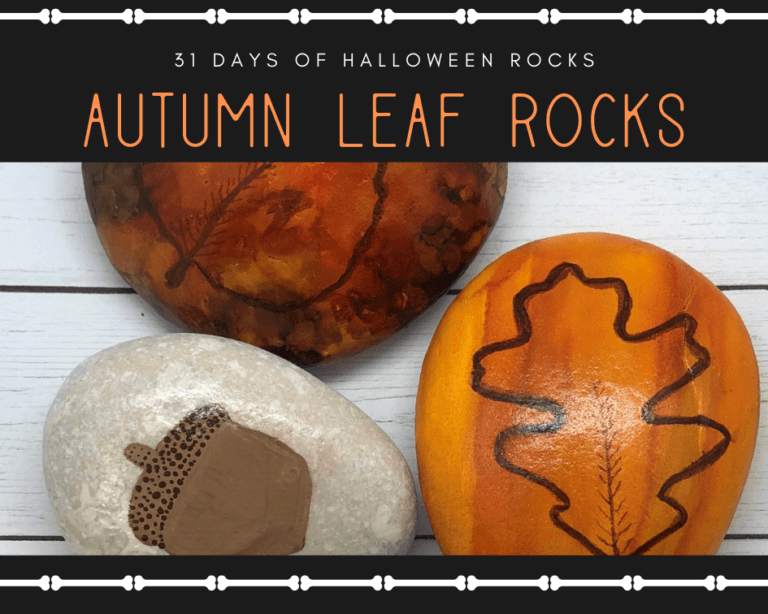 These autumn rock painting ideas are a part of another post called, 31 Days of Halloween Rocks, check it out for more boo-tiful rock painting ideas. Begin by painting a base coat of white craft paint on your rocks and let it dry. Drip a few drops of alcohol ink onto your rock. Less is more! Let the ink spread, you can help move it around by blowing on it, you can use a straw or compressed air to get a dramatic look. 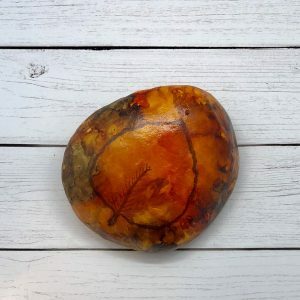 You can also use a paintbrush dipped in alcohol ink to paint a layer on your rock. Use different colors and see how the colors blend together. Use more alcohol to wet the alcohol ink by misting it on or using a paintbrush. Add more drops of alcohol until you think your rock art is done. 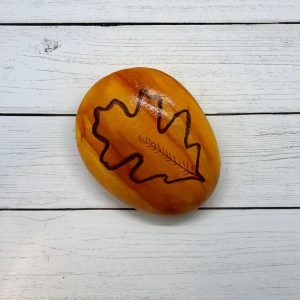 Use a leaf stencil or free-hand a leaf on your rock with a fine-detail brush in brown alcohol ink. After these beautiful autumn leaf rocks are completely dry, spray a clear sealer on the rocks and let it dry again for 24 hours before touching the rocks. 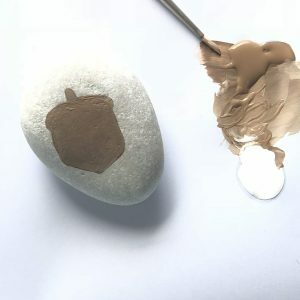 Trace out an acorn on a rock with light brown craft paint using a detail brush. Paint the acorn with a layer of light brown paint. Using a dotting tool or a paintbrush, paint dark brown dots on the top of the acorn. After acorn rock is completely dry, spray a clear sealer to protect it from scratches and the outdoor elements. Acrylic craft paint is water-based, fast-drying, but also easy to clean off of skin. Read 25 Hacks Every Artist Should Know for clothing stain removal tips and other great painting tips. Be sure to wear gloves because alcohol ink will stain your hands. Be sure to protect your work surface by using paper plates or something similar while using alcohol inks. Be sure to use alcohol ink in a well-ventilated area, due to the strong alcohol odors. 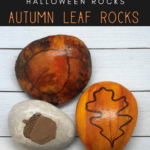 Have you made your own Fall leaves rock painting?